cbse.nic.in 2018 Class 12th Result is to be declared today (26.05.2018). It can be checked online at cbseresults.nic.in 2018 Class XII Results page. 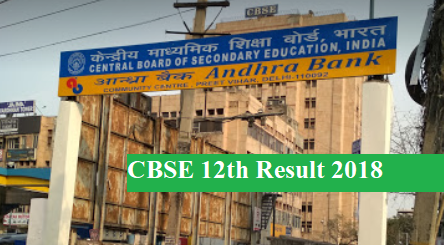 Students who are waiting for a long time CBSE 12th Result 2018, now they can know their performance in the CBSE Sr. Secondary (Class XII) Exam 2018. The CBSE Class 12th Result 2018 information will available on www.cbse.nic.in later you can find the same from its results declaration website cbseresults.nic.in. Central Board of Secondary Education, New Delhi is going to declare the results of annual sr. secondary examination 2018 for all regions. Students who have appeared in this examination are now able to check their marks using Roll Number and Roll Code. It is very important to know that the date and time of publication of results through its official website cbse.nic.in. According to the latest news released by the various News portal, the CBSE is all set to declare its class 12th results on May 26, 2018 (Saturday). First, the board is going to announced class 12th results 2018 for Arts, Science, Commerce and later it also be declared CBSE class 10th result. The Results may come out at 12th P.M. via online. As we know that, the Central Board of Secondary Education (CBSE) is the largest educational board in India which provides academic qualification to the students. The board conduct class 10th and 12th examination every year. A huge no. of students appear in both examinations from all over India. This year, around 28 lakh students have enrolled for Class 12th Exam and 10th Examination. The CBSE also organized the examination out of India. In this year, Class 12th examination has successfully conducted at 4500+ centres all over India and 71 centres outside of the county. The examination was started from 5th March and end on 13th April 2018. Now, the time to know the Result of CBSE 12th Class Results for the session 2017-18. Find the link as ' CBSE Results 2018 Class XII (All Regions)'. Now, Enter your Roll No. and click the submit button to show your marks. After appearing your results on screen, you can save it as soft copy or take a print copy on A4 size plain paper using a printer.